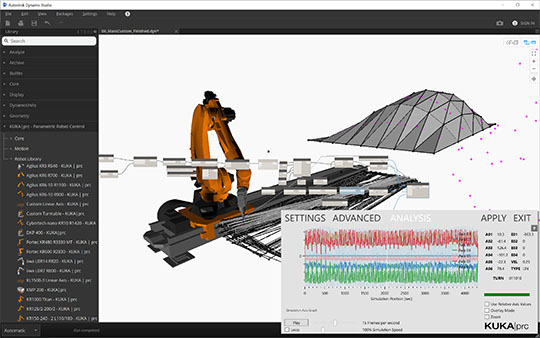 We are proud to present a public preview of KUKA|prc for Autodesk Dynamo. To encourage testing, we are providing a full-featured license of KUKA|prc to everyone, with a license valid until March 31st, 2019. The current release is optimized for Dynamo Studio 2017 (Dynamo Core 1.3). Dynamo is available as a free evaluation software. When testing the software, please expect problems and issues. We are kindly asking you to provide feedback through the forum! Following the testing period, KUKA|prc for Dynamo will be made available as a free version with reduced functionality and a full version for all members, in parallel to the Grasshopper version at no extra cost. Is their any where in particular in the forum you would like error reporting and feedback? sample for fusion import is broken picture of error here. looks grate so far was hoping to get an idea for its frame rate compared to grasshopper and rhino 5. The forum is fine, thank you for pointing that out! I've implemented that rrequest (http://forum.robotsinarchitecture.org/index.php/topic,903.0.html) and must have messed up somewhere. However the problem seems to be fixed on my end. Do you need that component urgently, or just out of interest? I may be able to send you an early release if it's urgent. Performance-wise I couldn't give you a clear answer, Dynamo definitely has got the slower 3D viewport than Rhino, so things seems a bit sluggish at times. Componentwise the 3D rendering is quite different, so there can also be difference. KUKA|prc wise it's the same logic, so there shouldn't be huge differences. I just checked again, the problem is that I've updated the component but not the example. Instead of the Boolean, please provide either a negative or positive double. A positive number overrules the Fusion-generated speeds (e.g. when you want to do a quick test "in the air"). wow fast reply, cool will try your fix. no importance just the tool was offered and thought it was worth comparing to rhino, as thinking about Rhino6 upgrade, but dynamo looks more flash graphics but only importance is function and speed. will keep watching with interest.